"Ansaugspinne BBM RB-Engine 413, 426, 440cui Torker II"
Give your engine top-end horsepower without affecting the mid-range. 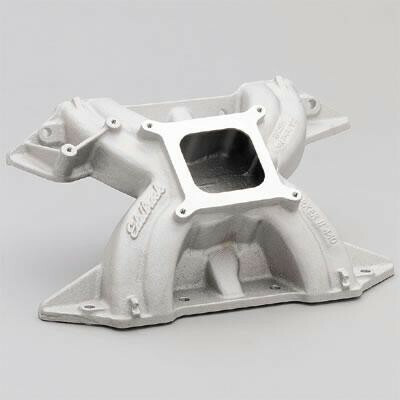 Edelbrock's Torker II intake manifolds feature a single-plane, low-rise design that can give you top-end horsepower without affecting the mid-range. What Edelbrock did was increase the plenum volume and alter the short-side radius of the runners, to give the air/fuel charge a straight shot at the intake valves. That straight shot produces a potent power build from 2,500 to 6,500 rpm.